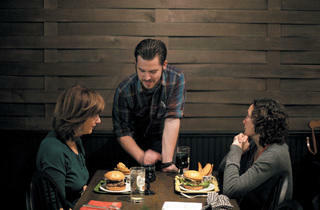 Two burger lovers debate thin and griddled versus big, fat and cooked-to-order. Burgers are personal—one of those foods that can trigger instant nostalgia. My own archetypal burger requires the elemental combination of soft bun, thin beef patty given a flip or two on the griddle, minced onions, satiny melted American cheese, piquant ketchup and mustard, and the cool tang of pickle chips. This classic formula evokes riding home from school in the 1980s in my mom’s minivan and swinging through the drive-through. Yes, my first burger love was the McDonald’s cheeseburger. 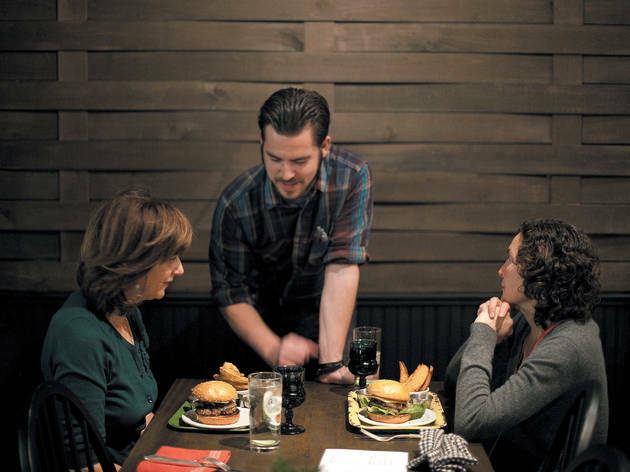 In today’s age of piling burgers high with ungodly indulgences such as pulled pork or foie gras, it’s getting harder to find a thoughtfully prepared old-fashioned burger in Chicago, but the five here manage to adhere to old-school ideals. Kevin’s Hamburger Heaven At the counter of this pillbox of a greasy spoon, watch the grill man flatten fresh balls of chuck into patties. Ask for the One and Only with grilled onions; they come caramelized to a deep, delicious brown. 554 W Pershing Rd (773-924-5771); 4056 S Western Ave (773-847-4947). $5. 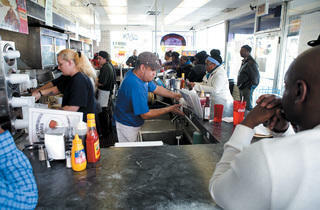 Schoop’s This minichain of diners serves the epitome of this classic style and my favorite burger in Chicagoland. Schoop’s reps won’t reveal their secrets, but I suspect they use a high-fat beef to produce a burger with an ethereally crispy crust and lacy edges. Be careful with your ordering: When a single cheeseburger weighs in at a half-pound, the double overwhelms. Multiple locations. $5. 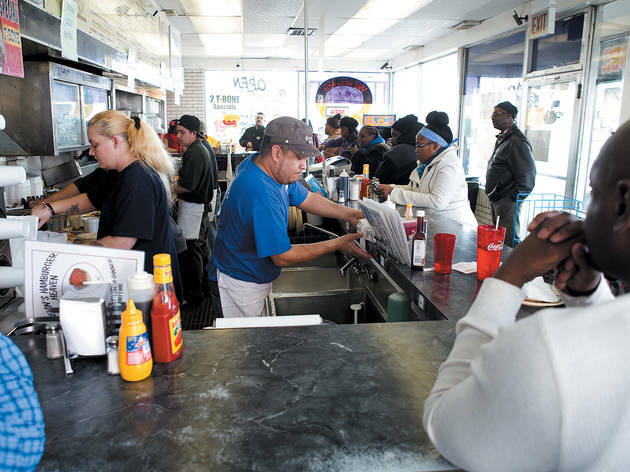 That’s A Burger This South Shore hole in the wall has a loyal following, and rightfully so. It turns out one of the best burgers in Chicago—a juicy, loosely packed patty with beautifully crisp edges—even if there is no room inside to eat it. 2134 E 71st St (773-493-2080). $5, includes fries. Top Notch Beefburger A 59-year-old Beverly institution, this frozen-in-amber diner is the natural habitat of malts and beef tallow French fries. The cheeseburger is one of the beefiest around, and the bun is well-toasted for a contrast in texture. 2116 W 95th St (773-445-7218). $4. My ideal hamburger does not come tucked in a sleeve of wax paper or wrapped in crinkly silver foil. My burger stands proudly on a dinner plate, its patty as thick as a Dickens novel, the sum of its parts announcing its presence by towering over the accompanying stack of fries. My burger is the kind you don’t want to eat until you cut it open with a knife and admire the deep pink-red hue of the rare beef. My burger does not come dripping in ketchup; my burger becomes soaked in yolk once I pierce the trembling yellow top of the fried egg adorning it. I love this burger because when done right, the meat is the star—no matter how rich the sauce, or how pungent the cheese. In a good burger of this style, probably at least three cuts of beef have been hand-ground, hand-blended and hand-formed into the loose, succulent patty before you, bringing out a texture and flavor lost in meat smashed on a griddle and cooked past pink. In the end, a cooked-to-order burger could be topped with nothing and I’d be happy. But without the burger joints of the last decade—the kinds of places one-upping each other with how many permutations they can make on meat plus cheese plus bread—the big, fat, juicy burger I love may not have taken root. Thus, how can I say these restaurants, their foie gras and all, are anything but the best thing to happen to beef since Wendy’s stopped airing that annoying commercial with the old woman? I can’t. So bring on the Gruyère. The bacon jam. The horseradish aioli. Not too many toppings, and not too much of each. Translation: I may be advocating for new-school burgers, but I’m not buying into the sickening heap of goat cheese on top of my last monstrosity at Kuma’s. Try these five spots instead. Bad Apple Go on Wednesdays for the 45-day dry-aged blend of Wagyu and prime rib, made for Bad Apple by New York butcher Pat LaFrieda. This is a steak disguised as a burger (proof that carbs make everything better), and that’s why it’s worth the $26 price tag. 4300 N Lincoln Ave (773-360-8406). Butcher & the BurgerAsk for rare at this BYO and chefs actually deliver. For extra flavor, select a sassy spice blend to be mixed into the beef. 1021 W Armitage Ave (773-697-3735). $9–$9.50, toppings free–$12.50 (for foie gras). Grange Hall Burger Bar Grass-fed beef tastes magically rich in these loosely packed patties, which you can top with extras from apple-bourbon relish to half-melted slabs of sharp cheddar. 844 W Randolph St (312-491-0844). $9, toppings $1–$2. Royce John des Rosier’s new burger spot is one of the few I’ve found that has a prebuilt option I like better than anything I’ve created. The Godfather balances spicy (giardiniera), creamy (Parmesan mayo, mozzarella) and beefy (grass-fed chuck) in each bite. 1850 2nd St, Highland Park (847-433-8600). $13, includes fries.